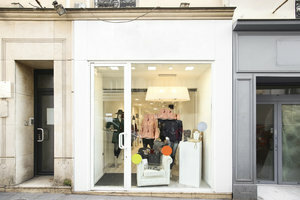 This modern 37 sq m boutique in the bustling area of Sentier is a great location for Pop-Up Stores, Ready-To-Wear Retail and Product Launches. With large display windows and white frontage, the store is inviting and provides good visibility. The interiors are minimal in largely white, modern spotlights give the space a bright atmosphere and the shop is finished to an excellent standard. There is a range of product display furniture including garment racks and shelves which make this boutique ideal for fashion retail. Surrounded by fashion retailers and popular restaurants, this space benefits from good passing foot traffic from a stylish demographic, ideal for fashion brands looking to gain exposure in a trendy environment.